Green infrastructure is an approach to managing stormwater that enables it to filter into the ground near where it falls, or captures it for later use. Examples include bioretention, permeable pavement, vegetated swales, street tree trenches, green roofs, and cisterns. Best Management Practice (BMP) means a practice, or combination of practices, that is determined to be an effective and practicable means of preventing or reducing the amount of pollution generated by nonpoint sources to a level compatible with water quality goals. A BMP can be a structural “thing” that you actually install on the ground. Examples may include runoff diversions, silt fences, stream buffers and groundcover vegetation over bare soil areas. Landscape features that convey stormwater from one location to another while removing pollutants and allowing water to infiltrate. Bioswales are often designed for larger-scale sites where water needs time to move and infiltrate slowly into the ground. 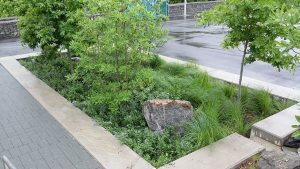 Much like rain garden systems, bioswales can also be designed with an underdrain pipe that allows excess water to discharge to the nearest catch basin or existing stormwater system. 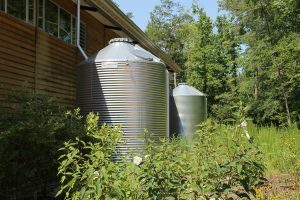 Storage tanks that store rooftop runoff and are placed either above or below ground. 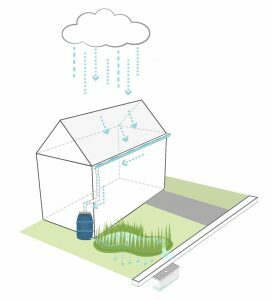 Cisterns are used for larger rooftops and can capture and store between 100 and 10,000 gallons of runoff. The stored water can then be used for watering gardens, washing vehicles, or other non-potable uses. 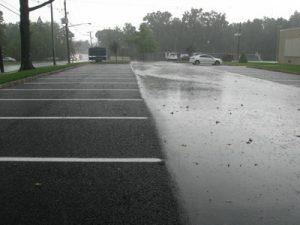 During rain events, stormwater flows can exceed the capacity of the combined sewer system and/or the sewage treatment plant, causing an overflow to local waterways of a slurry of untreated wastewater and stormwater. 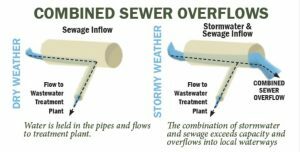 Twenty-one cities and towns in New Jersey have combined sewer systems and/or sewage treatment plants that may cause combined sewer overflows during rain events. A wastewater collection system designed to carry sanitary sewage (consisting of domestic, commercial, and industrial wastewater) and stormwater (surface drainage from rainfall or snowmelt) in a single pipe to a treatment facility. Twenty-one cities and towns in New Jersey have combined sewer systems. When stormwater runoff flows directly from an impervious surface to a local waterway or a sewer system, the impervious surface is considered “connected” or “directly connected.” This picture shows one example: a gutter downspout connected to a pipe that goes to another pipe, which ultimately discharges to a stream or river. When stormwater runoff flows from an impervious surface onto a pervious surface or into a green infrastructure practice prior to entering a local waterway or a sewer system, the impervious surface is considered “disconnected.” In stormwater terms, being disconnected is a good thing! Open-topped containers made of sturdy materials and consisting of soil media with plants that provide an opportunity to reuse rooftop runoff. 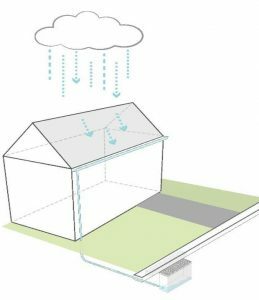 Although small, these systems have some capacity to store rooftop runoff during rainfall events and release it slowly back into the storm sewer system through an overflow. Roofing surfaces that are partly or completely covered with vegetation. Green roofs provide stormwater management by slowing down rainfall runoff and by allowing a portion of the precipitation to be returned to the atmosphere through evapotranspiration. Green roofs also reduce heat islands. This action awards points for the installation of green roofs. 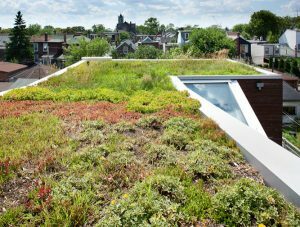 Green roof systems capture stormwater runoff, improve air and water quality, reduce the urban heat island effect, provide aesthetic benefits, and extend the life of roofing materials. A stormwater management approach that incorporates vegetation (perennials, shrubs, trees), soil, and engineered systems (e.g., permeable pavements) to slow, filter, and cleanse stormwater runoff from impervious surfaces such as streets and sidewalks. 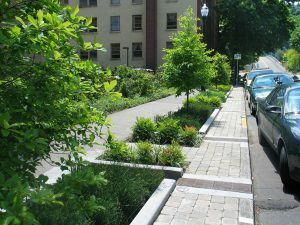 Green streets are designed to capture rainwater at its source, where rain falls, whereas, a traditional street is designed to direct stormwater runoff from impervious surfaces into storm sewer systems (gutters, drains, pipes) that discharge directly into surface waters, rivers, and streams. Readily available land use/land cover data from the New Jersey geographic information system (GIS) database are used to determine the percentage of impervious cover in municipalities by subwatershed. The ICA includes calculations of stormwater runoff volumes associated with impervious surfaces. A plan that identifies opportunities to retrofit specific sites with green infrastructure practices to reduce the impacts of stormwater runoff from impervious surfaces. Any surface that has been covered with a layer of material so that it is highly resistant to infiltration by water; examples include but are not limited to paved roadways, paved parking areas, and building roofs. A system-wide evaluation of the sewage infrastructure and the hydraulic relationship between sewers, precipitation, treatment capacity, and overflows that identifies measures needed to eliminate or reduce the occurrence of CSOs. 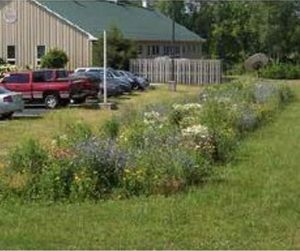 A land planning and engineering design approach that emphasizes conservation and use of on-site natural features to manage stormwater runoff and protect water quality. A conveyance or system of conveyances (including roads with drainage systems, municipal streets, catch basins, curbs, gutters, ditches, man-made channels, or storm drains) that transports stormwater runoff to local waterways or stormwater facilities such as a detention basin. The Municipal Stormwater Control Ordinance establishes minimum stormwater management requirements and controls for “major development,” as defined in the Stormwater Management rules (N.J.A.C. 7:8 et seq.). The Municipal Stormwater Management Plan (MSWMP) is also a component of the municipal master plan (N.J.S.A. 40:55D-94). The MSWMP describes the municipality’s strategy, structure, and process for addressing stormwater runoff from new development and redevelopment to ensure compliance with the Stormwater Management rules (N.J.A.C. 7:8 et seq.). A Municipal Stormwater Mitigation Plan is an optional element of a Municipal Stormwater Management Plan, but is required for a municipality to grant a variance or exemption to the design and performance standards for stormwater runoff quality, stormwater runoff quantity, and groundwater recharge, established under the Stormwater Management rules at N.J.A.C. 7:8-5. The NJPDES program protects New Jersey’s ground and surface water quality by assuring the proper treatment and discharge of wastewater (and its residuals) and stormwater from various types of facilities and activities. To accomplish this, permits are issued limiting the mass and/or concentration of pollutants that may be discharged into groundwater, streams, rivers, and the ocean. The New Jersey Stormwater Best Management Practices Manual (BMP Manual) was developed to provide guidance to address the standards in the Stormwater Management rules (N.J.A.C. 7:8 et seq.). The BMP manual provides examples of ways to meet the standards contained in the rule. The BMP manual has been created to assist review agencies and the regulated community. New Jersey Stormwater Management Rules (N.J.A.C. 7:8) set forth the required components of regional and municipal stormwater management plans, and establish the stormwater management design and performance standards for proposed new development. The design and performance standards for new development include groundwater recharge, runoff quantity controls, runoff quality controls, and buffers around Category One (C1) waters. New Jersey Water Quality Management Planning (N.J.A.C. 7:15) establishes area-wide Water Quality Management (WQM) plans, which are umbrella plans, each with various adopted components that address different aspects of water resource planning. Wastewater management plans (WMPs) assess the cumulative water resource impact of future development and are a component of the area-wide WQM plans. Total maximum daily loads (TMDLs), which address existing water quality impairment and establish an implementation plan to restore the water quality of those waters, are another component of the area-wide plans. The individual components are adopted into the appropriate area-wide WQM plan in order to give them effect. Nonpoint source pollution is also called “people pollution.” It is the pollution that comes from our everyday lives. It is the fertilizers that wash off our farms and lawns. It is the pet waste that washes into our streams. It is the sediment (or soil) that erodes from our lands into our local waterways. It is the oil and grease that comes from our parking lots. Finally, it is the pollutants such as nitrogen, phosphorus, and heavy metals that settle out of our atmosphere onto our roads and rooftops. When it rains, stormwater runoff carries nonpoint source pollution that may ultimately wash into our waterways. Paved surfaces that allow stormwater to infiltrate into an underlying stone layer that stores it and allows it to seep slowly into the ground. With the installation of an underdrain system, these systems can be used in areas where infiltration is limited and will still filter pollutants and provide storage, but will not infiltrate the runoff. 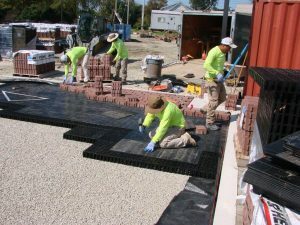 There are three types of pervious pavement systems: pervious concrete, porous asphalt, and interlocking permeable pavers. Pervious surfaces (also known as porous or permeable surfaces) allow water to percolate into the soil to filter out pollutants and recharge the water table. Examples include planting beds, mulched beds, gravel, permeable pavers, pervious asphalt, forested areas, and meadows. Turf and lawns are pervious, but generally much less so than the above-mentioned surfaces. Solid surfaces that do not allow water to penetrate, forcing it to run off, are called impervious or impermeable. Examples include traditional asphalt, concrete, brick or stone, and traditional roofs. Residential Site Improvement Standards establish statewide requirements for improvements made in connection with residential development, including streets and parking, water supply, sanitary sewers, and stormwater management. 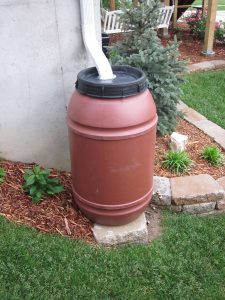 Generally 55-gallon barrels that are placed under a gutter’s downspout, which are used to collect rainwater from roofs. The stored water can then be used for watering gardens, washing vehicles, or other non-potable uses. 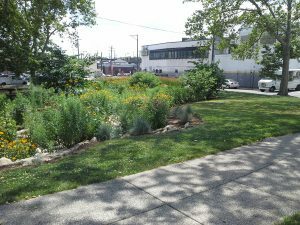 Rain gardens, or bioretention systems, are landscaped, shallow depressions that capture, filter, and infiltrate stormwater runoff. Rain gardens remove nonpoint source pollutants from stormwater runoff while recharging groundwater. Rain gardens serve as a functional system to capture, filter, and infiltrate stormwater runoff at the source while being aesthetically pleasing. Vegetated areas along streams; the vegetation is typically native and is generally a combination of trees, shrubs and grasses. Stormwater runoff flows into the riparian buffer where it slows down and drops its litter and coarser debris; some of this runoff is then either taken up by the plants or is infiltrated into the soils, where chemical and biological reactions occur that treat the pollutants in the runoff. This results in less runoff entering the stream, and the portion of the runoff that does enter the stream is cleaner. Vegetated structures that are built into the sidewalk to intercept stormwater runoff from the sidewalk or roadway. 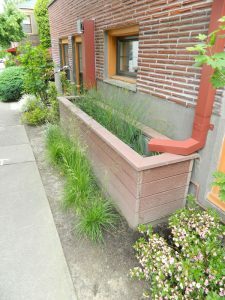 Stormwater planters, like rain gardens, are a type of bioretention system. This means many of these planters are designed to allow the water to infiltrate into the ground. However, some are designed simply to filter the water and convey it back into the storm sewer system via an underdrain system. Water from rain or melting snows that can become “runoff,” flowing over the ground surface and returning to lakes and streams. 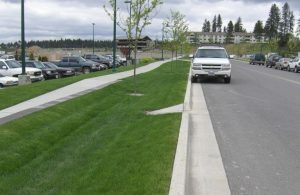 A linear stormwater management feature, typically placed near sidewalks, that combines trees with an underground stormwater management system. On the surface, it looks like a regular tree with a drain, but an underground stormwater system manages and reduces runoff to provide additional stormwater management. Wetland systems designed to maximize the removal of pollutants, particularly nitrogen, from stormwater runoff through settling, uptake and chemical transformation. These systems consist of two distinct components: the above-ground wetland cells and the below-ground gravel cell. Stormwater flows into the wetland cell, where pollutants are treated through settling and uptake by the wetland plants. Stormwater then slowly enters the underground gravel beds that store runoff between events. A special type of bacteria grows on the saturated gravel, which breaks down the nitrogen compounds dissolved in the water. Pre-manufactured concrete boxes or enhanced tree pits that contain a special soil mix and are planted with a tree or shrub. They filter stormwater runoff but provide little storage capacity. They are typically designed to filter stormwater quickly and then discharge it to the local storm sewer system. Broad, shallow channels designed to convey and infiltrate stormwater runoff. The swales are vegetated along the bottom and sides of the channel, with side vegetation at a height greater than the maximum design stormwater volume. The design of swales seeks to reduce stormwater volume through infiltration, improve water quality through infiltration and vegetative filtering, and reduce runoff velocity by increasing flow path lengths and channel roughness. New Jersey Department of Environmental Protection. (2018). Green Infrastructure in New Jersey. Retrieved February 25, 2018, from http://www.nj.gov/dep/Green Infrastructure/.